I have always been curious to peep into a celebrity’s normal day at home. Do they do their dishes, cut veggies, clean the toilet, water plants, do laundry…like we normal mortals? Long last, Aamir and Kiran opened their home to show me they have husband-wife conversations like in any common household…But my starving countrymen are all pouncing over one another to prove who’s best at interpreting what the star-couple’s private conversation means. Aamir also said a few other lines apart from the ‘India-leaving’ sentence. ‘Kiran feels scared to open the newspapers everyday’… ‘I am alarmed by the number of incidents…’ Why isn’t anyone interested in those? He definitely didn’t say it for the 2-minute fame. However, the same cannot be said about all those reacting? How many of those hollering their epiglottis out would sit munching popcorn with their feet up if their child doesn’t return home on time from campus? How many moral polices will laze under the covers if they do not hear from their kids who stay afar from them? It was a mother’s concern for her baby’s future that Kiren voiced to her husband. Yes, as a celebrity he should have censored that when on a public forum. Because public figures ought to speak responsibly, so as “not to stoke unrest”. But shouldn’t they speak their mind? Else, why speak. Again, always a personal story helps you connect with the audience quicker. It helps drive home the point easily. And bigger the personality, the quicker it gets soaked in. Yes, we are one proud nation. We do not wait for another to help us get on our feet. We are able, capable and far better than any others on this planet. We’re the epitome of diversity and pluralism!! And that’s exactly why we need to halt spewing our mirth and check why off late such talks are being heard frequently? Earlier, Shah Rukh Khan came under fire for his remarks on intolerance and BJP leader Kailash Vijayvargiya called him ‘anti-national’. There’s no dearth of elected representatives exposing their filthy minds off. If the nation can let them pass, why pounce on celebrities? Little wonder Indian celebrities don’t take part in discussing serious national issues unlike in the West. We believe they are public property and it’s we who provide them our share of oxygen to help them earn their keep. Isn’t that why Aamir’s entire body of work of all these years was rubbished in a day? We as a nation consider it our birth right to own our celebrities. So they better walk on our leash. Else this is what we do, tighten the noose. And then if the outside media talks of what we do on our turf, we rise up in arms lecturing them on secularism and diversity and democracy… and take them to ‘our’ Mahatma Gandhi and Buddha, too. It’s extremely sad that the Constitutionally-granted Freedom of Speech is today tagged with an unwritten clause of the citizen’s station, his/her political allegiance and religious beliefs. Dr Ambedkar would be turning in his grave! 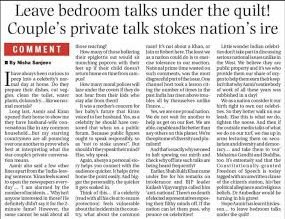 Hope Aamir has learnt his lesson… to leave bedroom talks under the quilt! Oh there is so much I want to say about this but then I have seen rational debate or discourse just ends up in deaf ears…I don't know when we will realize we are responsible for what we say..
Rightly said, Nisha. People are having a feast cracking up jokes on Aamir's remark. Whatsapp is filled with such nonsenses. I think some people live for this. This one should have just set aside as another remark by a citizen. Hmm! The speed at which WhatsApp jokes are bombarded no sooner an incident happens really amazes me! Lot of food for thought here, to be very honest, Nisha. On the whole, I do wish people would learn to listen to anyone (celebrities or otherwise) without resorting to extreme reactions. A lot would be simpler to handle if so.